August 26, 2015 – As the 2015 general election in Canada closes out the first month of campaigning, the New Democratic Party (NDP) carries momentum – and the lead – among likely voters. get too excited, new polling data also shows both Conservative and Liberal campaigns with advantages they’ll be looking to build on in the weeks ahead. For the Conservative Party (CPC), it is the notable solidifying of its vote base. For the Liberal Party (LPC), a notable jump in favourability for leader Justin Trudeau. An online survey of more than 6,000 eligible Canadian voters – analyzed and released by the Angus Reid Institute – indicates the NDP ahead by a nose in the national horserace, with 36 per cent of decided support among likely voters (see notes on methodology at the end of this report), four points ahead of the governing Conservatives (32%), while the Liberals pull up third at 23 per cent. Perhaps reflecting the fact that the electorate is squeezing out the last of summer, these results are statistically unchanged from data released by the Institute in June. These latest survey findings show the NDP and leader Tom Mulcair holding their own in the first four weeks since the writ was dropped – and in the wake of the first leaders’ debate held Aug. 6. Despite what has been generally viewed as a competent campaign thus far for the LPC and Trudeau, the party remains stuck with about one-fifth of the likely vote. And while the Conservatives have taken a pounding in the news cycle, seen their leader’s credibility come into question in the wake of testimony from the Mike Duffy trial, the party’s fortunes among those most expected to cast a ballot haven’t fallen. Neither, however, have they improved. While political junkies may sift the tealeaves for what these – and many other – polling results actually mean so early in the race – one picture begins to emerge: the CPC may not have gained much momentum with the electorate at large, but it has spent the summer successfully locking in an already largely committed base. Indeed, the number of uncommitted voters in Election 2015 is significant. Each wave of this poll asks respondents not only which party they intend to support, but also how certain they are that they will vote for the party (versus changing their mind before election day). The most recent wave shows the uncommitted comprising roughly half the electorate (50%), slightly lower than the 56 per cent measured in June. The reduction in the ranks of the uncommitted may be explained in the graph below: as each party has managed to build on the number of committed – or certain – voters over the last two and a half months. The next graph shows the significance of this “locking-in” for the Conservative Party. In the case of the NDP and the Liberals, support is essentially split between committed voters who say they won’t budge – and “soft” voters who leave themselves the option to switch parties between now and Oct. 19 (55% versus 45% NDP and 52% versus 48% Liberal respectively). But the CPC enjoys the advantage of its committed vote outnumbering its soft vote by a margin of nearly three-to-one: 74 to 26 per cent. Second Choices: Who Stands to Gain Most? In a campaign as long as this one, gaffes, twists and surprises can change the direction, momentum and ultimate outcome of the election result. When something goes wrong enough for a party leader to turn supporters off entirely, voters’ second choices take on more significance. 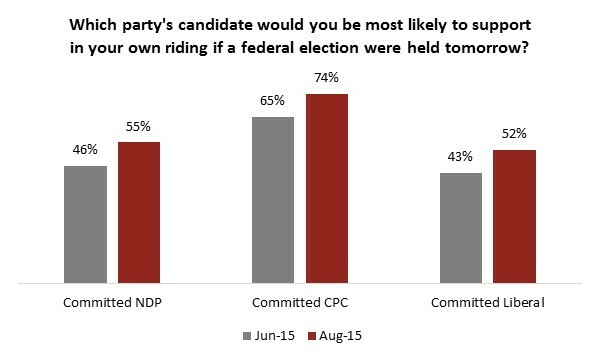 The CPC: second choice of just one-in-ten soft LPC voters (10%) and about the same number (11%) of soft NDP voters. Given their second-choice options, it may come as little surprise that Canadians also choose an NDP-Liberal coalition as the most preferred of likely election outcomes. The clear preference in these results is for a government with the seats necessary to form a majority, which makes sense – partisans would prefer to see their party dominate than eke out a narrow victory. The relatively high level of support for a coalition comes largely from those who are inclined to support the Liberals in the upcoming election. Almost three-quarters (73%) of this group favour a coalition, despite the fact that Liberal Leader Justin Trudeau has repeatedly rejected such an arrangement. Election 2015 has been described as a series of provincial elections across the country – with niche campaigns created for key regional battlegrounds. The sample size of this poll – well over 6000 respondents – enables the Angus Reid Institute to provide rich data sets on voter preference, not only in terms of national voter intent, but provincially and regionally too. Unlike Ontario, Quebec has seen the gap between parties widen and stay wide. A narrow majority of Quebecers now say they support the NDP, while the re-emergence of Gilles Duceppe as the leader of the Bloc Quebecois has had no practical impact on that parties fortunes in la belle province. Fully two-fifths of respondents (41%) say their opinion of Harper is “very unfavourable,” nearly triple the total reporting a “very favourable” view of the Conservative leader (15%). Among soft voters, nearly seven-in-ten (69%) have an unfavourable view of Harper, roughly the same number as have a favourable view of Mulcair (71%). Soft voters also tend to be more favourable toward Trudeau than the general population (61% favourable among soft voters, compared to 53% overall). The general pattern seen in favourability ratings is also reflected in each leader’s “momentum score” –derived by subtracting the percentage of people reporting that their opinion of a leader has worsened in the last three months from the percentage who say it has improved. Mulcair is viewed as the federal leader would make the best prime minister – 29 per cent of Canadians now say so. The NDP leader’s fortunes have changed substantially since March, when just 16 per cent reported him as their top choice, well behind incumbent Stephen Harper, who held a seven-point lead on his closest challenger at the time, Justin Trudeau (30% to 23%). Where Mulcair has gained, Harper and Trudeau have ceded ground. Roughly one-quarter (26%) say Stephen Harper is still the best man for the job. Harper has trended downward in the past six months (see chart below). Trudeau, who last held a lead on this question in February 2014, is now the choice of 18 per cent of Canadians. 21 per cent of Canadians are yet unsure whom would be the best person in the Prime Minister’s Office. Just one issue dominates Canadian minds in this election: the economy. Fully two-in-five (42%) list it as one of the two most important issues facing Canada today, up significantly from the 30 per cent who listed it as such back in June. The dominant position of economic issues in the minds of Canadians could bode well for Harper’s re-election effort. More respondents (29%) see him as the best party leader on the economy – the highest endorsement among the three main party leaders. But Mulcair isn’t far behind on this key metric. One-quarter (25%) of Canadians see Mulcair as best on economic issues. The NDP leader has narrowed the gap between he and Harper on this question since June, when 30 per cent chose Harper as best on the economy and 22 per cent chose Mulcair. The percentage of people who choose Trudeau as best leader on the economy has also ticked up slightly, from 15 per cent in June to 17 per cent. The data from all survey respondents or “eligible voters” uses standard census-based targets to ensure a national sample that is representative of the adult Canadian population as a whole by key demographics such as gender, age and education and region. All survey results are reported for this total group.